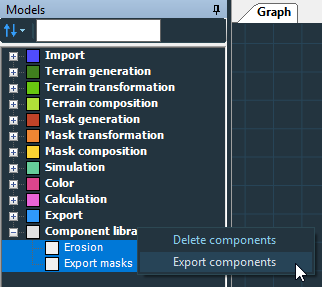 In the Models window, select one or more components and either select File > Export components... or right-click to open the contextual menu, and select Export components. Enter a name of the .terralib file and click Save. A pop-up dialog confirms the export. When exporting components that embed other components, Instant Terra automatically detects the components used by the components you want to export and adds them to the list of components to export. For example, you can export a component with an embedded component or multiple components with several embedded components. 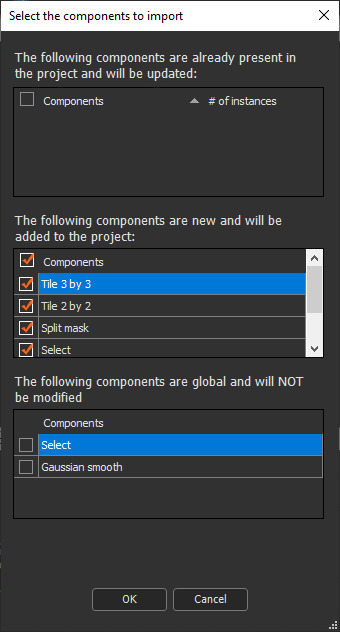 When importing a component into a project, no link is preserved between the project file (.terrain) and the component library file (.terralib). If a component is updated in a .terralib file, it will not be automatically updated in a .terrain file that uses this component. To update it, simply re-import the .terralib file containing the new version of the component. Enter the name of the a .terralib file and click Open. A pop-up dialog confirms the import. Check the components to import and click OK. 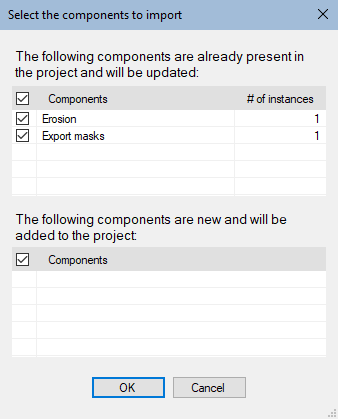 If the components are already in the current project, the import updates the components so that they exactly match those in the .terralib file that is imported. The number of instances of each of the components is displayed. If the component is modified during the import, for example, inputs, parameters, or outputs are added or deleted, the instances are also updated. Parameters may be added or deleted. Inputs or outputs can be added or deleted. This adds or removes the corresponding connectors on the component nodes. If a node is attached to a connector that disappears during the update, the link automatically disappears. When you deselect a component that is used by other components, these components are automatically deselected, and Instant Terra displays a message. 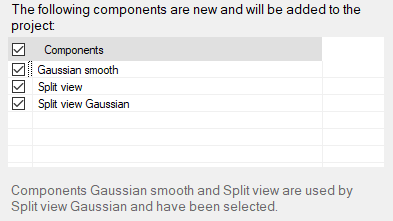 Check the boxes to select and deselect the components to import. When you select a component that requires other components, these components are automatically selected, and Instant Terra displays a message.